We have the pleasure to announce the 10th European Summer School on Experimental Nuclear Astrophysics (Santa Tecla School), devoted to the education of young Ph.D. students and young researchers. The school belongs to the European Network of Nuclear Astrophysics Schools (ENNAS), a network made by the European schools on nuclear astrophysics and related areas (the Santa Tecla, the Sinaia, the Russbach school), having the common effort of preparing and educating young physicists in nuclear physics, astrophysics and their mutual relationship in the nuclear astrophysics field. For such a reason, the school will deal with both various astrophysical issues, ranging from primordial nucleosynthesis to stellar evolution, and nuclear topics, including novel experimental approaches, radioactive ion beams, and indirect methods. The lectures of the school will be given by high-quality level scientists, selected for their didactical skills. The lectures are scheduled in plenary morning and afternoon sessions. In the spirit of the school, large room will be given to young researcher oral contributions. Specific sessions will be allocated to allow them to present their latest scientific results. The school is hosted in the conference hall of the INFN LNS in Catania. 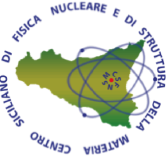 The school is supported by the INFN LNS, Dipartimento di Fisica e Astronomia (DFA-UniCT) of Catania, ENSAR2-NUPRASEN and Centro Siciliano di Fisica Nucleare e Struttura della Materia (CSFNSM).